This antibody is specific for MBD2 (N term). 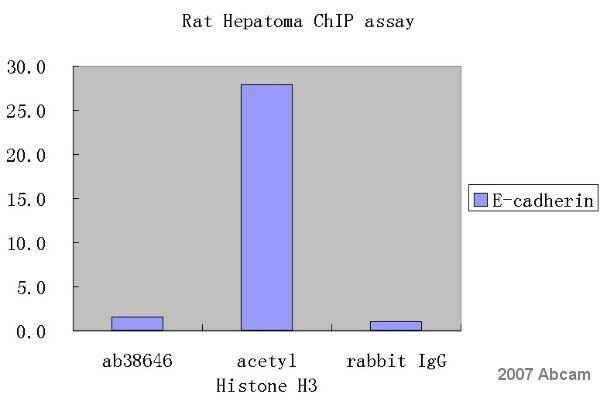 Rat - Abreview feedback has stated that this antibody works on rat prostate. It gives some non-specific band in rat testis, probably due to presence of other MBD isoforms. Synthetic peptide corresponding to Human MBD2 aa 120-151 (N terminal) conjugated to keyhole limpet haemocyanin. A375 cell lysate and mouse brain tissue lysate. This antibody was eluted out with both high and low pH buffers and neutralized immediately after elution then followed by dialysis against PBS. Our Abpromise guarantee covers the use of ab38646 in the following tested applications. WB 1/100 - 1/1000. Detects a band of approximately 43 kDa (predicted molecular weight: 43 kDa). Nucleus. Nuclear, in discrete foci. Detected at replication foci in late S phase. ab38646 immunoprecipitating MBD2 in human K562 whole cell lysate. 15µg of cell lysate was incubated with primary antibody (2 µg/ml in RIPA buffer) and matrix (Protein A/G) for 12 hours at 4°C. 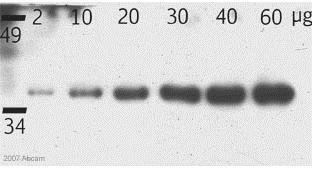 For western blotting a HRP-conjugated goat anti-rabbit IgG polyclonal (1/2500) was used as the secondary antibody. 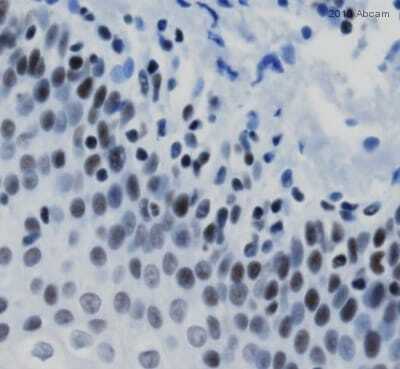 ab38646 staining MBD2 in Human tonsil tissue sections by Immunohistochemistry (IHC-P - paraformaldehyde-fixed, paraffin-embedded sections). Tissue was fixed with paraformaldehyde and blocked with 1% BSA for 10 minutes at 25°C; antigen retrieval was by heat mediation in a citrate buffer, pH 6.0. Samples were incubated with primary antibody (1/500 in TBS) for 12 hours at 4°C. An undiluted alkaline phosphatase-conjugated Goat anti-rabbit IgG polyclonal was used as the secondary antibody. Immunocytochemistry/ Immunofluorescence - Anti-MBD2 antibody (ab38646)Image courtesy of an anonymous Abreview. ab38646 staining MBD2 in rat liver cultured cells by Immunocytochemistry/ Immunofluorescence. The cells were fixed in formaldehyde, permeabilised in 0.1% Triton X-100 and then blocked using 1% BSA for 1 hour at 25°C. Samples were then incubated with primary antibody at 1/50 for 10 hours at 25°C. The secondary antibody used was a goat anti-rabbit IgG conjugated to Alexa Fluor® 568 (red) used at a 1/400 dilution.